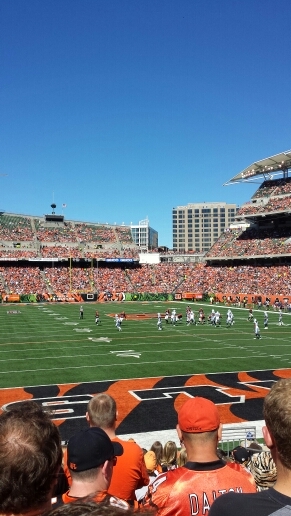 Attending a Cincinnati Bengals game has been on my “To Do” list for several years. I have always admired the Cincinnati skyline in passing to and from Detroit. Pregame, we stopped in Eli’s BBQ for ribs, turkey sandwiches topped with coleslaw, and jalapeño cheese grits. My vote is for Eli’s over Montgomery Inn. The laid back atmosphere was like a backyard picnic. I was so excited walking towards Paul Brown stadium along the river walk. I saw a lot of activity and thought about my fellow Cincinnati running bloggers. 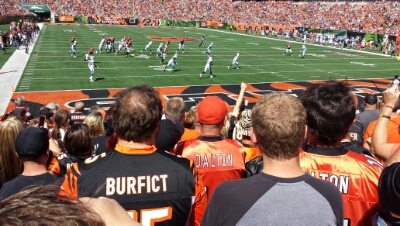 At the kickoff, my dream became reality as I sat in the 11th row of section 158. I wanted to be in the die-hard fan section, not amongst the wine and cheese crowd. 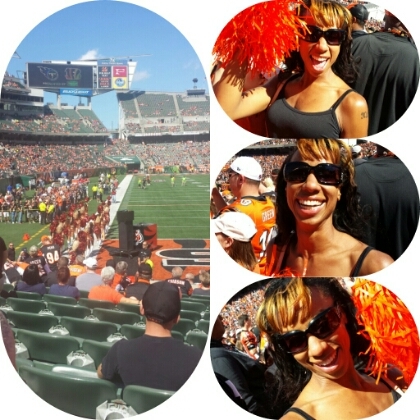 I learned the Bengals touchdown song and the “Who Dey” chant. The weather was perfect, with a breeze coming off the Ohio river. I met a couple that drives all the way from Huntington, WV for their season ticket seats. 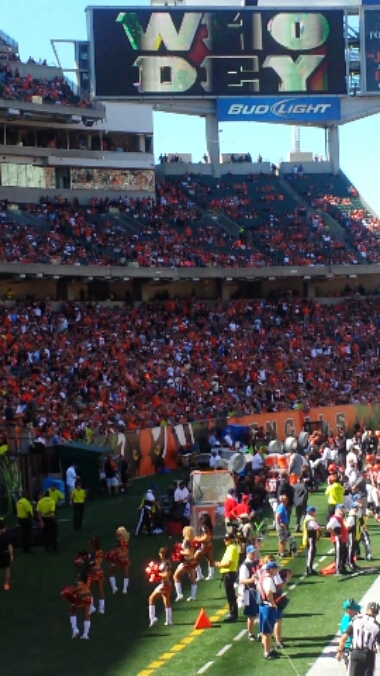 “Who Dey” yelling. One fan had a voice that should be on a Madden game for background sounds; so perfect for football. We women were just as loud; no tea parties or Ray Ricing in the end zone. 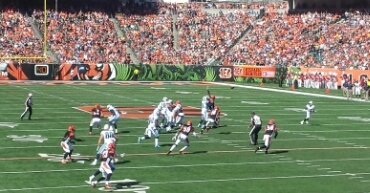 We witnessed #14 Andy Dalton catch his first career reception touchdown. This was also a first in the history of Bengal quarterbacks. Sweet! 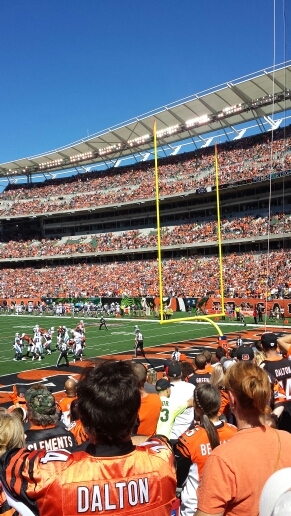 I would love to watch the Bengals with a tougher opponent. It felt good to see them win 33-6. I wish the had Titans put up a little more fight to make it a nail-biting experience. 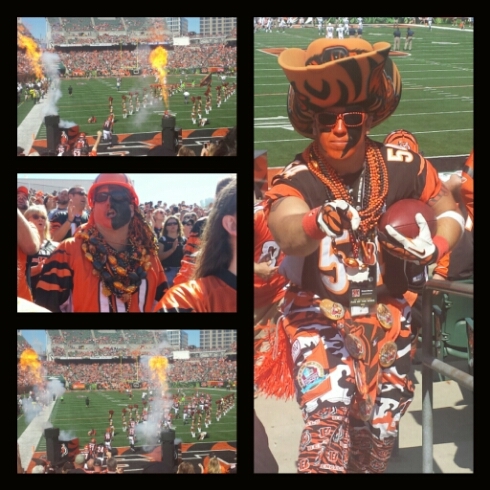 This entry was posted in Cincinnati, football, Travel and tagged Bengals, Eli's BBQ, Who Dey. Bookmark the permalink. Glad you had fun! Being a native Ohioan, I always kind of root for the Bungles…er uh, I mean Bangles, but I’m a Browns fan first and foremost. 🙂 Enjoy my homestate!!! It’s weird that I don’t really have a team. I root for the Lions because that’s the home state. I get to return the Bengals hoodie I didn’t wear because it was so warm. Cincinnati is one of my favorite skylines for sure!!! Sounds like a fun time. I keep saying I’m going to go to a Cincinnati Reds baseball game and just never have done it. Motivation!! I was checking out their ball park. They play at home this weekend!